Aspergillus is a widely used host organism for the industrial production of homologous and heterologous proteins. Although Aspergillus niger is most commonly used, a close relative of this species, Aspergillus vadensis, has been suggested as a suitable and more favourable alternative due in part, to the low levels of extracellular proteases which it produces. Despite much progress being made in the hyper production of homologous proteins, the yields obtained for heterologous proteins have still not reached a comparable level. Genetic strategies, including the development of strong constitutional promoters have been shown to lead to an increase in the levels of recombinant protein production. In this study, six novel constitutional promoters from A. niger (pef1α, ptktA, pef1β, ptal1, pcetA and ppgkA) and a further five from A. vadensis (pef1α, prps31, pgpdA, pubi1 and poliC) were tested in A. vadensis using a gene encoding a secreted arabinofuranosidase from Fusarium oxysporum as a reporter for heterologous protein production. 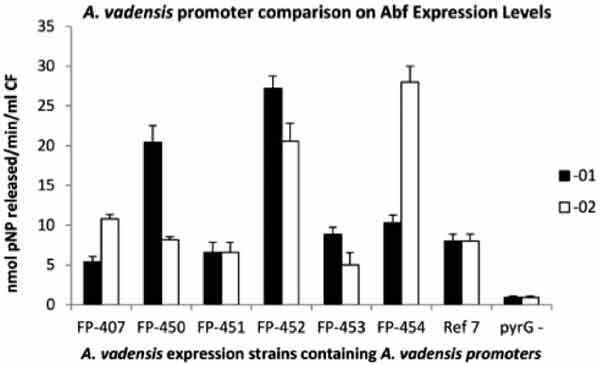 Remarkably, 9 of the 11 promoter constructs tested resulted in higher ABF activity than the commonly used gpdA promoter. While this could partly be assigned to the number of copies of the expression cassette in the transformants, clear differences in productivity of the promoters could be observed. α-arabinofuranosidase, Aspergillus niger, Aspergillus vadensis, Fusarium oxysporum, genetic engineering, heterologous protein production, promoter study. CBS-KNAW Fungal Biodiversity Centre, Uppsalalaan 8, 3584 CT Utrecht, The Netherlands.